I was born in Holzminden/Weser, Germany in 1960. The following year my family and I moved to Perchtoldsdorf, a suburb of Vienna, Austria. After finishing school in 1980 I started to study German and Journalism, and although this was quite interesting, it was not really fulfilling. 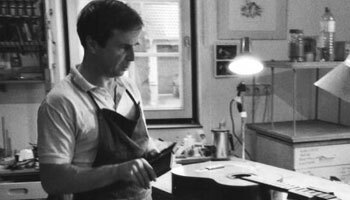 1989 was quite an eventful year – I not only received my Master Craftsman’s Certificate in Vienna, but also attended a third course with José Romanillos, this time in Córdoba, Spain. Since 2001 I have worked as a founder member of “N.I.C.E. – Neufeldner Instrumentenbauer Congress und Erlebnistage“ (“The Neufeld Instrument Makers’ Congress and Event”), an association for the continuing education/professional development of makers of musical instruments.